Xigmatek Zest, a new generation Rambo RGB PC case with front and left tempered glass, it's colorful and breathtaking and perfect for display your professional system build, the case chassis designed for all major ATX, M-ATX and Mini ITX gaming or professional motherboard available to the market, E-ATX motherboard friendly also, so you can use Zest to build your dream PC system. The chassis have 180mm CPU cooler clearance and 430mm for VGA card clearance, also support liquid cooling radiators front 240/280/360mm, rear 140mm and top 280/360mm. Easy to do cable management and hide all the messy cables for a tidy display, Zest the latest innovation from Xigmatek, perfect for gaming and any professional system build. Prosper chassis is one of Xigmatek’s latest innovative chassis to date; it comes with 4 sides 4mm thick tempered glass panels to beautifully display every component of the build. Prosper comes with four pre-installed Xigmatek’s SC120 RGB LED fans with room for up to 7 case fans, and fully compatible with 360mm, 280mm and 120mm radiators. Prosper is definitely the most beautiful case XIGMATEK has ever made; users are in for a treat. Prosper chassis is one of Xigmatek’s latest innovative chassis to date; it comes with 4 sides 4mm thick tempered glass panels to beautifully display every component of the build. Prosper comes with four pre-installed Xigmatek’s blue LED fans with room for up to 7 case fans, and fully compatible with 360mm, 280mm and 120mm radiators. Prosper is definitely the most beautiful case XIGMATEK has ever made; users are in for a treat. 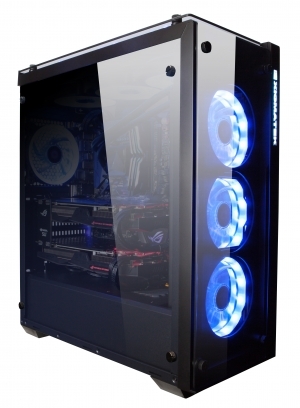 Xigmatek Poseidon, a new generation two side tempered glass PC case with LED stripe front panel, the case chassis designed for major ATX, M-ATX and Mini-ITX gaming or professional motherboard. Support 165 mm CPU cooler clearance and 300 mm VGA card, up to six 120mm fan or 240mm liquid cooling radiators at top and front, 120mm at rear for excellent cooling performance. Pre-install with Xigmatek Galaxy AY120 addressable RGB fan, able to support MB Sync and build a full RGB effect system in one control. Poseidon is the perfect choice for a professional system build and display the RGB effect at the same time. 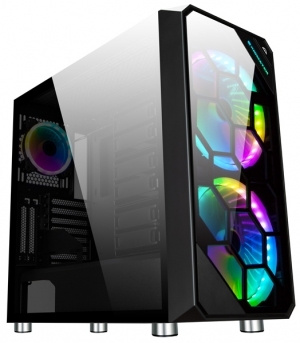 Xigmatek Nemesis is the latest gaming case comes with stylish front panel and left side tempered glass, the case chassis designed for major ATX, M-ATX and Mini ITX motherboard. Support 158mm CPU Cooler clearance and 340mm VGA card, up to six 120mm fan or liquid cooling radiators front & top 240mm and rear 120mm for excellent cooling performance. PSU shroud design easy to do cable management and hide all the messy cables for a tidy display. This case is the perfect one to set up a beautiful gaming PC build! 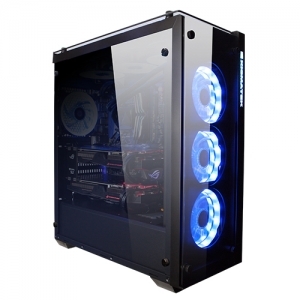 Xigmatek Iris is the latest gaming case comes with elegant front panel and left side tempered glass, the case chassis designed for major ATX, M-ATX and Mini ITX motherboard. Support 158mm CPU Cooler clearance and 340mm VGA card, up to six 120mm fan or liquid cooling radiators front & top 240mm and rear 120mm for excellent cooling performance. PSU shroud design easy to do cable management and hide all the messy cables for a tidy display. This case is the perfect one to display a beautiful PC build! Copyright © XIGMATEK Co., Ltd. All rights reserved. Design by DAKE.